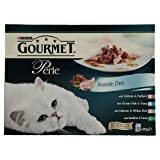 Gourmet Perle Seaside Duo Wet Cat Food 85g x 12 Pouches. Seaside Duo is a delicate cat food that will tickle your fancy and offer you an irresistible taste experience every day. This entry was posted in Uncategorized and tagged 1020, Adult, Food, Gourmet, Mixed, Pack, Perle, Purina, Seaside, Variety by One Boutique. Bookmark the permalink.